It has been nearly 2 1/2 years, I think it's about time to tell our story. After all, my experiences on September 16th 2011 have led me down a path that I otherwise wouldn't have traveled. While Jackson was not planned, finding out I was pregnant was a wonderful surprise. I had an amazing pregnancy, and felt stronger, happier and healthier than I have felt in my whole life. My EDD (estimated due date) was 9/10/11. At that point, I was feeling some pretty intense back pain, so I was ready to meet my little man. However, he had other plans. At my 40 week midwife appointment, I was told that if I didn't go into labor on my own by 41 weeks, I would need to be induced. I told her I wouldn't be doing that. It was pretty disheartening to learn that even midwives offer this type of fear based mis-information. Six days later, I woke up feeling some good contractions. I took a nice warm bath and relaxed for a bit. It was about 7am. I made my way downstairs and decided to sit on my yoga ball and have some breakfast. The contractions continued while the rest of the house woke up. My contractions continued at a steady pace, and were increasing in intensity, but I knew it wasn't time to go yet. DUH, Jen. . . you knew this! I think it was around 10am when we decided that I should call my doula and start making the drive to the birthing center. We got in the car, and I was REALLY thankful that we had narrowly missed the brutal Friday morning rush hour in Chicago. There were moments that I was CERTAIN that I would be giving birth in the passenger seat of my little hybrid car. After we arrived at the hospital, and checked, I was almost turned away. They have that rule "four or the door". I knew all about it because I completely prepared myself with months of classes. But in the throws of it, I'm sorry... my body was telling me otherwise. Hindsight, I suppose I was having back labor compounded by a defect in my lower back. Once I was admitted, the contractions continued to come and go. They were very painful sometimes, and then manageable others. (honestly I wish I had been laboring in the comfort of my home for most of the day.) Because I was in a birthing center, I was allowed to eat, and move around, and rest and stretch. The "plan" was to have a natural water birth, with the support of my mom, doula, and one of my dearest friends. My room had a queen sized bed, a large free standing birthing tub, a yoga ball, a recliner, and my favorite that day... a bean bag type pillow. I brought an electric diffuser with my favorite oil - Eucalyptus Spearmint. Every nurse and midwife that came in told me how great the room smelled, which made me happy. I had my favorite songs playing on repeat, which made me happy. My dear friend Anthony brought his ever present sense of humor (which is even funnier when he is nervous), which made me happy. For hours, I changed positions, did most of my practiced stretches, and moved all around the room, all the while going through some intense back pain and contractions. When my midwife came in again, somewhere around 10pm if I remember correctly, to check me. . . I was at 4cm. FOUR CENTIMETERS!!!! After 12 hours, I hadn't budged. I knew this was part of the problem of going to the hospital too soon... but like I said, the contractions I was having (which at that point I'm not convinced they even were) felt so intense! I was in the moment, and apparently wrong. This next part is really hard for me to discuss, and may be equally hard to read, but I think it is important to share. Cathartic for me, and maybe helpful to other mommas that have had a hard time dealing with their "derailed" birth plans. So partially clothed and dripping wet, I started running toward the bed, yelling that I had to push. My doula was trying to prevent me from breaking my neck on all the water all over the floor, and I was yelling for my midwife. Yup, totally calm now. She graciously decided to pacify me, and see how close Jackson was to entering this world. It was almost satisfying to see her scrambling to get things ready, because in less than 10 minutes, I had in fact dilated 6+cm. ALMOST. Until I realized that I was not being helped into the birthing tub that I had planned on for the past 8 months, but onto a birthing stool. Minor detail at the time, because I was definitely too busy to complain. :) I am not entirely sure how much time lapsed at this point, but with my mom in front of me, Anthony in the recliner in the corner (I was very clear I didnt wan't him "south of the border") and my doula sitting behind be FULLY supporting my weight . . . I hear the words, "Jen, reach down and catch your baby." For a few fleeting moments, I held my son on my chest, and felt feelings that I never knew were possible. He was P.E.R.F.E.C.T. I could almost not process everything that was happening. I did know that my midwife delayed the cord clamping for a bit longer than she wanted to, but not quite as long as I would have preferred. Did my mom cut the cord? I just don't remember. Because the next thing I knew, they had taken my son from me, and he was on his way to the nursery for "Blah Blah Blah". I had my doula trying to pump for me. I had my midwife stitching me up. I had this woozy feeling that I couldn't/didn't explain to anyone, and all I knew was that I WANTED MY SON!!! After getting myself up off of the bed, attached to some kind of wheeled contraption, I felt a familiar feeling. The feeling that I had to push. At the very same moment, the looks on my Mom and Anthony's faces told me something was very wrong. I know someone yelled for help. Seconds later my midwife was telling me to stay calm while the room filled with people and machines. I didn't understand what was happening at the time, but once I felt the pain, it really didn't matter. While ripping through my brand new stitches, my midwife discovered that I had a 4lb blood clot. Almost 1/2 the size of my little boy, was a blood clot that could have killed me. Many of the moments following that are foggy. I remember a fight between my midwife and my doula about meds. I remember someone saying that Jackson wouldn't be nursed for HOURS anyway. I remember my mom checking on my baby. 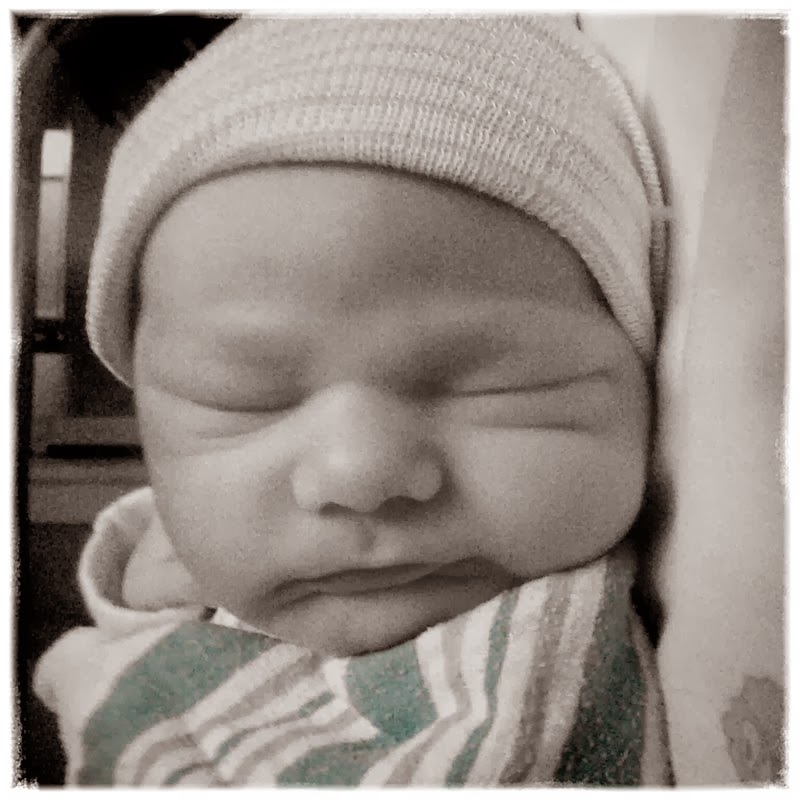 I remember seeing pictures on Anthony's phone of my brand new baby, alone in another room, with an IV in his hand. I remember feeling completely helpless, and that no matter how much I protested, no one was able to put Jackson in my arms. The next thing I remember is holding him. I remember nursing him for the first time. I think it was 5am when they brought him back to me. From that moment on, I did not let him out of my sight for another second. At 10:51pm on Friday September 16th, 2011, my life was forever changed. As angry as I still am about how my desired birth was stolen from me, I am happier to be Jackson's mom, than anyone ever told me that I would be. He is a very healthy little boy, with no obvious damage from his traumatic first hours. I am alive and able to care for my little monster, with no obvious damage from the trauma my body went through after birth. If you have made it this far, I appreciate you taking the time to hear our story. I would do it again, with no hesitation . . . and the only thing I would change, is location. Next time, it will be a water birth at home.